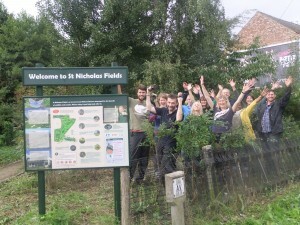 St Nicks have been holding bespoke Corporate Volunteering Days since 2007. Our 24-acre nature reserve is a remarkably original place for your staff to volunteer at. We host exciting team challenges for between 5-15 individuals that fulfill your organisation’s Corporate Social Responsibility objectives. We welcome volunteers from any company that fits in with our Ethical Policy. Our staff will offer your team a fantastic day out learning brand new skills in a unique setting, so why not don your wellies and get out of the office for a truly memorable day? Take a look through these pages and contact us to discuss the options for your Corporate Volunteering Day in more detail. Our nature reserve, a reclaimed landfill site, is a unique setting for your team to volunteer – a fun and enjoyable work site with a great atmosphere. Corporate volunteering days fulfil your organisation’s Corporate Social Responsibility objectives and are an exciting and cost-effective alternative to corporate away days. Your volunteering day will provide networking opportunities for staff. Your staff will enjoy learning new skills in a truly inspirational setting. Our urban nature reserve, located just 1 mile from York city centre, is a thriving home for wildlife, boasting 50 species of birds and protected species such as water voles. Your team will make a tangible difference to a much-loved community green space.